Writing about my recent trip to Florida reminded me of another vacation I never wrote about. It was before I started this blog and at a point in my life where, due to various time constraints, I had stopped journaling. It’s the kind of once-in-a-lifetime experience I’ve always wanted to do justice in writing. Before I lose too much of my mind (being a writer is being on the brink, you know), I’d like to turn my scribbled notes on the journey into something a bit more coherent. My in-laws are travelers. They set aside some money and every year they go to a new place. They’re trying to see the world, and I think they’re method is excellent. It’s something me and my husband have talked about trying to replicate someday after we raise the kids we haven’t had yet. Back in 2010 they decided they’d like to do a family trip over Christmas. For me, it was my first time outside the US or Canada (I don’t count Canada as traveling to a foreign country because I immigrated here so it isn’t really exciting or exotic anymore, it’s home). We chose Belize because it’s warm (and when you live in the frozen north that’s important) it offered a beach on which to spend Christmas day, it hadn’t been overly commercialized yet (and believe me, my in-laws have encountered some fairly commercialized places on their travels) and it offered a chance to see some historical ruins (my husband is a history major). The planning for this trip was fairly extensive. The first step was to visit a travel clinic to find out what vaccinations we needed before departure. It’s always a good idea to look at the risks for the area to which you’re traveling. Luckily there were relatively few for us. We needed your standard Hepatitis vaccination and your standard tetanus shot. They also offered us dukoral. For those unfamiliar, it’s a vaccine which is supposed to prevent traveler’s diarrhea (and seems to do so well). But it’s an oral vaccination and dear lord is it horrible! I never made it all the way through the second dose. When you pour that stuff in water, it fizzes. The memory alone makes me shudder. Shots tended, we packed our bags and weighed them to make sure we wouldn’t go over weight (they really kill you on fees for international travel if you go over the weight limit). Our flight was scheduled to leave at some ungodly hour from Toronto’s Pearson International Airport. I can’t remember if it was 4:30 or 5:30, but since you have to be two hours early for those kinds of flights, some of us decided not to sleep before departure. Which made our time at the airport interesting. On a vacation like this, sometimes getting to your destination is as interesting as the rest of the trip. 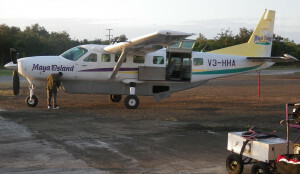 We started with a 4 hour flight to Roatán, Honduras on a regular sized plane. I mention this because I’m a bit leery when it comes to flying. I don’t like it. But I’ve done it so many times I’ve gotten used to it. It isn’t a big deal anymore. Most of the time. We had a stop-over of indeterminate time when we reached Roatán because we were on what my in-laws like to refer to as ‘island time’ by that point (meaning they get around to it when they get around to it). 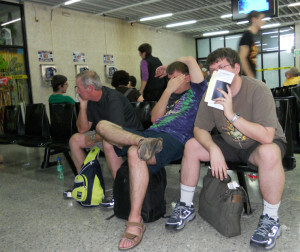 The Honduras airport was something of a hole. It consisted of one medium sized room full of people waiting to leave, one smaller room with a few extra chairs and a pair of tiny gift shops. We spent about three or four hours there and it was miserable for three reasons: 1) we were tired. 2) It was tiny and you couldn’t go anywhere else (they wouldn’t let us outside security for obvious reasons, and there wasn’t much space to move around or stretch your legs). 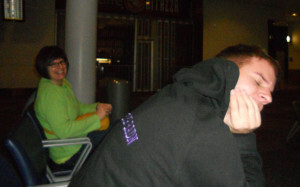 And 3) it was full of a plane full of people waiting to board our plane and end their vacations. Starting vacation is great, but when you’re headed back to the blah of every-day life people tend to be a bit more surly, if you know what I mean. Eventually they handed us a group of color-coded, laminated boarding passes we had to give back when we left. They divided us into groups of ten and took us to pairs of much smaller planes on the tarmac. Ten-seaters to be exact. I’ve ridden in small-ish propeller planes before. There’s a regular flight between Philadelphia and Toronto and another between Philadelphia and Harrisburg, both of which I’ve taken several times, that use these smaller planes. But ten seats is the smallest I’ve ever ridden in (and I honestly hope I never get in anything smaller). We were the first group into that plane (there were five of us), and my father- and brother-in-laws were so close to the pilot panel they probably could have touched it if they were dumb enough to try. Needless to say, I was a bit nervous. But once the plane was in the air, all concern went out the window. 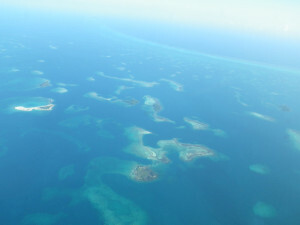 Because the ocean spread out beneath us, so blue and beautiful, dotted with tiny islands and reefs, that really I didn’t mind my airplane predicament. 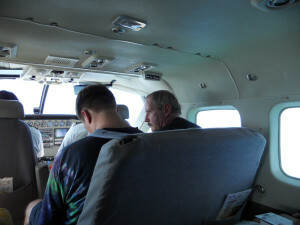 We landed and offloaded into a tiny two-room airport where we went through Belize customs. We were one of the last groups to make it through the check-in. By the time we reached our resort bus, we had to take whatever seats were available. From there it was a short hop over to our resort where we were greeted with fruit punch, complete with fresh fruit, and a trip to the restaurant on the pier for a much needed lunch. 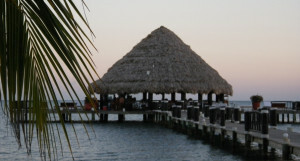 One of my favorite things about the resort in Belize was the restaurant on the pier. They served buffet style breakfast, lunch and dinner every day. And if you think it’s great to sit inside a restaurant and look out on the ocean while you eat, that’s nothing compared to sitting on it, looking out over a wooden railing, smelling the salt air, hearing the ocean lap at the pier supports. The walk to and from the beach was equally exciting because you could catch different sea life at different times of day. We often saw jellyfish floating in the lights of the evening, and in the mornings we saw crabs and starfish. I haven’t had much experience with ocean beaches in my lifetime. We spent a day and a half in Daytona on a high school trip when I was a freshman, and that was about it. I expected it to be crowded and I expected to spend a lot of time laying on the sand. But while there were plenty of people who stayed on resort all day, the beach was large enough and the resort small enough, that it never felt like we had to fight the crowds to get chairs to lay on or to take a quiet walk along the surf or whatever else we wanted to do. And after a long pair of days to arrive at our destination, relaxation was quite welcome.